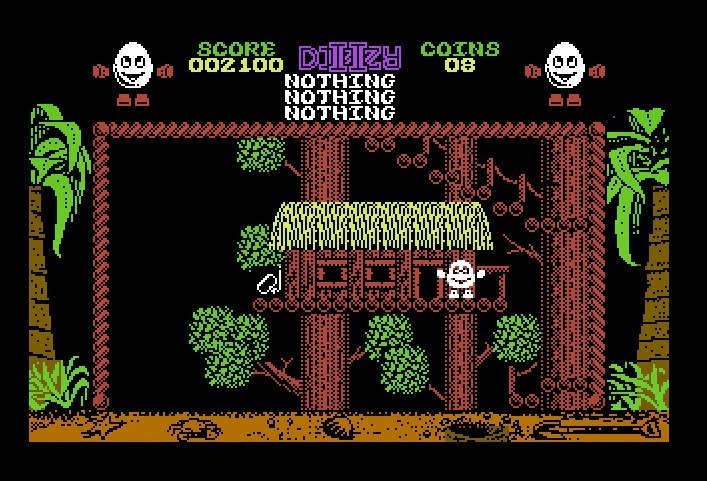 Treasure Island Dizzy is a flip screen, platform, puzzle and adventure game written by Philip and Andrew Oliver (aka The Oliver Twins) and was published by Codemasters in 1988 for a bargain price of £2.99. 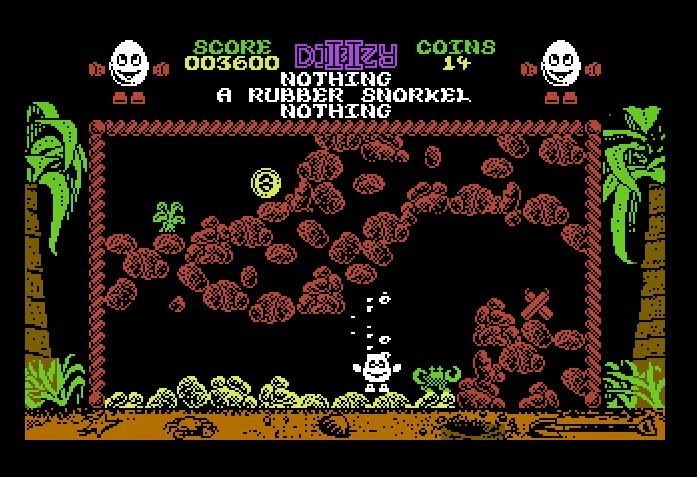 As with all Dizzy games, it was pretty much ported to every available system of the time. 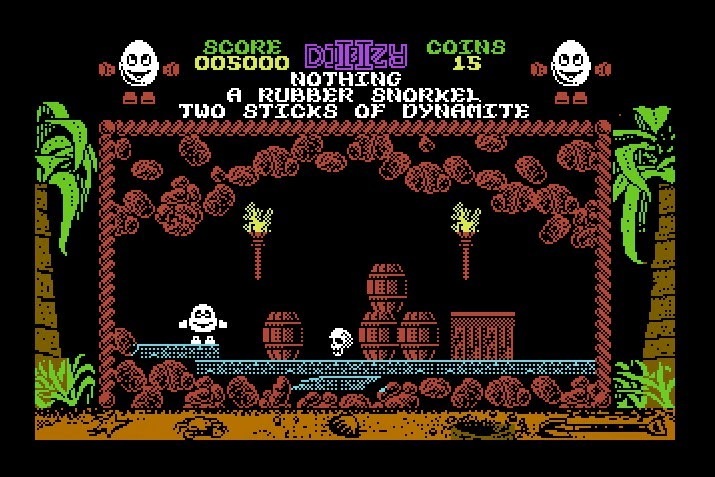 It was the second game in the famous Dizzy series and is my personal favourite - simply because it was the only Dizzy game I ever completed! Strange that this game has often been called the worst of the series because of the high difficulty level - you only have one life whereas the other games in the series give you multiple lives. 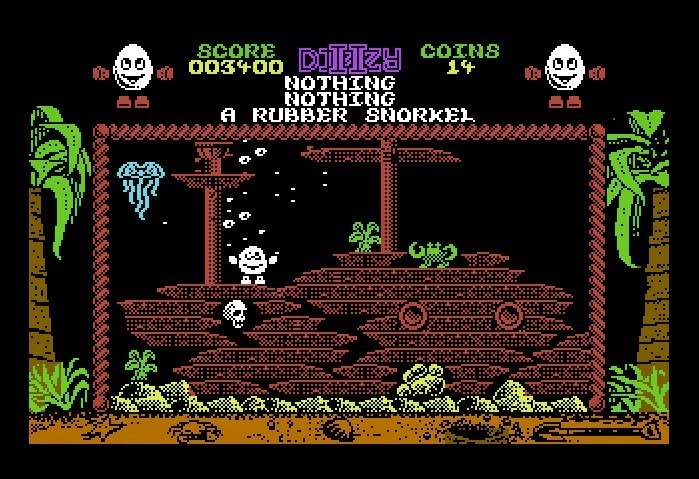 This means that you could potentially be almost at the end of the game, and if you make one simple mistake like dropping the snorkel (required so that you can breathe under water) whilst under water, you'll die and will have to start the game from the beginning. There's no save game option! 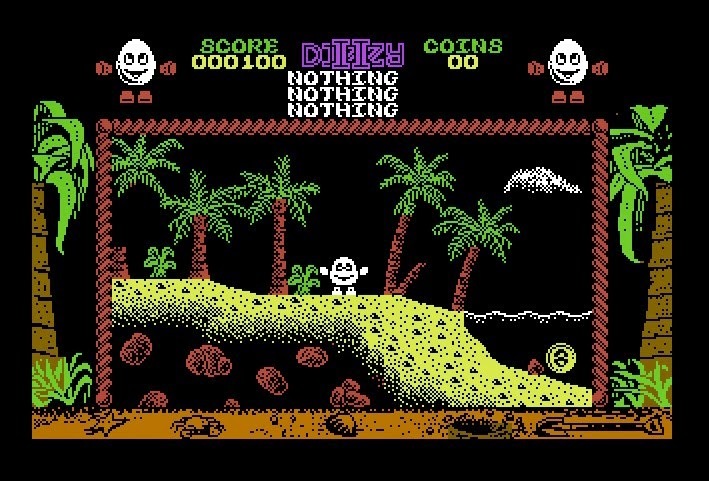 The aim of the game is to simply escape the island. 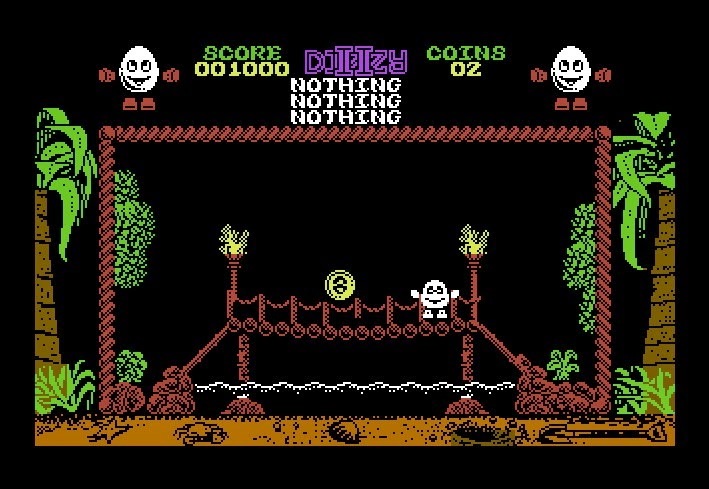 This involves you playing the titular character Dizzy (who is essentially an egg with feet and hands), picking up various objects scattered around and using them in the correct places. You're ultimate goal is to get a boat, an engine, petrol and an ignition key that will enable you to leave the island and head off for freedom. Sounds simple enough, but to do this you will also need to collect 30 gold coins. Some coins are easy to find, others are hidden behind various background objects like plants, boulders, windows etc. 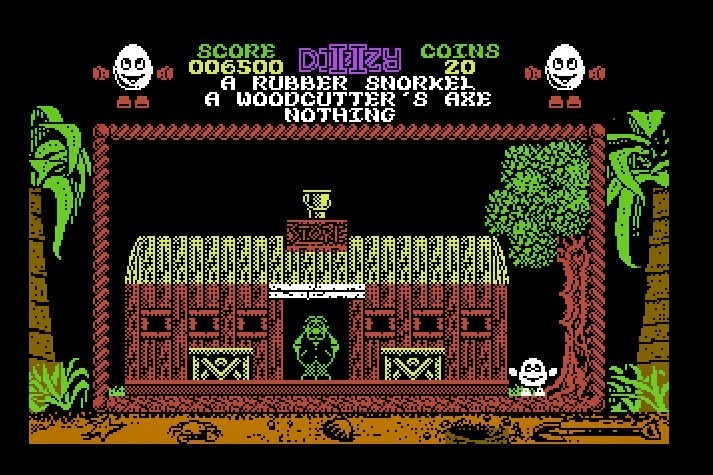 Collecting the coins is a bit like a side quest to the main adventure, but ultimately even though you can build the boat and leave, you still need to have the 30 coins to actually complete the game. 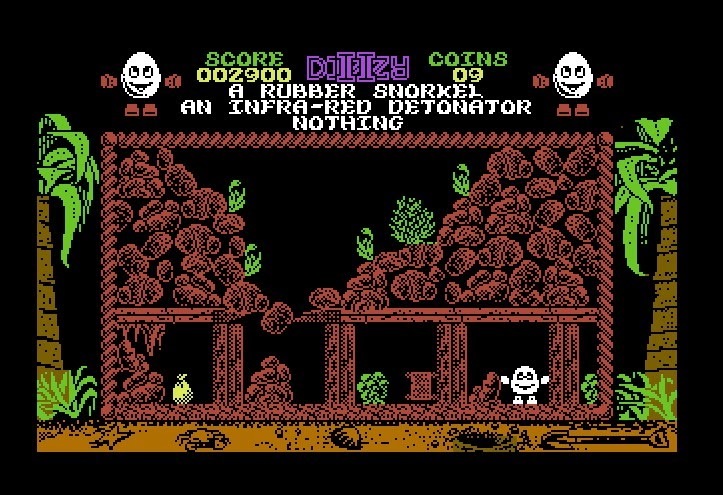 The game is a classic example of the excellent quality of some of the 'cheapo' games available to computer users in the late 1980's. It's fair to say I got more enjoyment out of this game than a lot of the full priced releases of the time by some of the larger software houses like US Gold and Ocean. 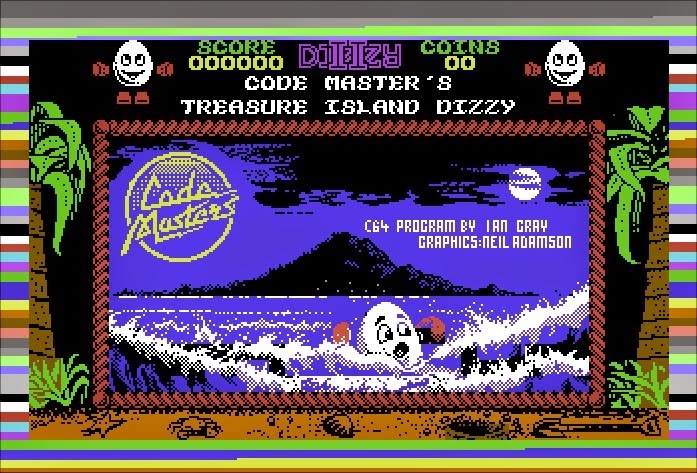 Despite the poor graphics that were obviously ported directly from a Spectrum (complete with monochrome hi-res graphics with colour clash), the game is wonderful, and I still think the Commodore 64 version has one of the best theme tunes ever to grace a computer game. A snorkel... Possibly the most important item in the game. Just don't drop it when you're in water. This guy will sell you the boat and parts you need to escape. The boat. Still need an engine, and petrol to escape. 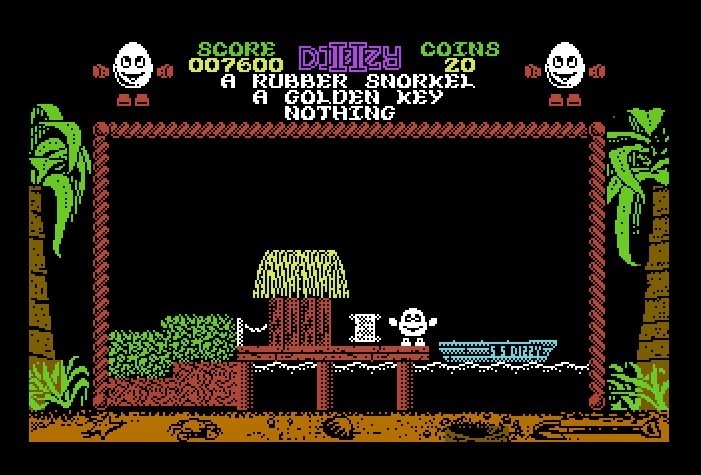 Maybe one day I'll get to actually finish the other Dizzy games! What's scary is that I was 11 years old when this game came out.... I'm now 37! 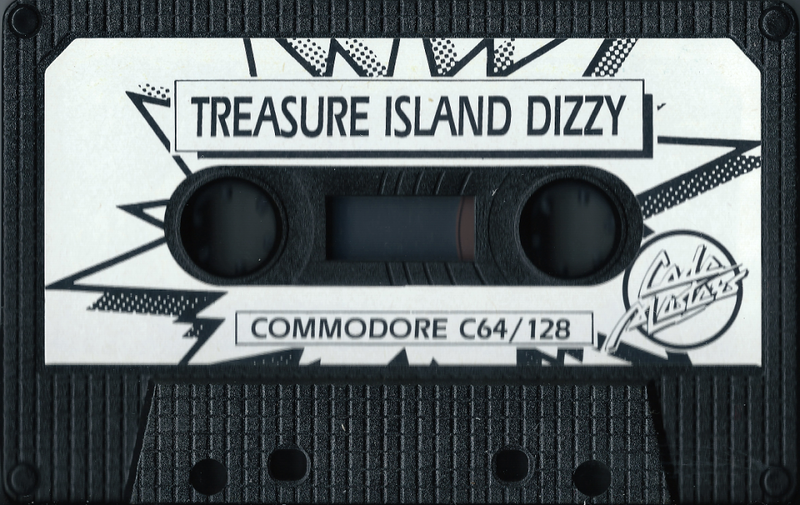 For now, have a listen to one of the jolliest pieces of music that has ever come out of the SID chip in a Commodore 64. Actually, so far this week has been far from being stressful (which is a pleasant surprise). We're two days in to the school summer holiday, and I've already managed to get most of what I wanted to do during the first week done and dusted. 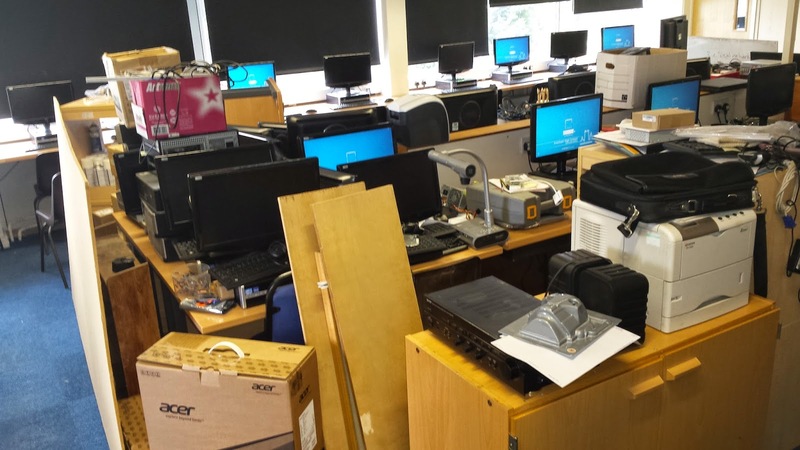 OK, I've had to relocate my office to a classroom while my office gets decorated, but so far I have managed to setup and configure 3 servers (1x physical and 2 x virtual), and setup an image of a new PC, ready to be 'ghosted' to a suite of brand new Acer X2631G i5 computers. And of course move my furniture back in to my usual office. My office for the past 2 days while my office gets decorated. 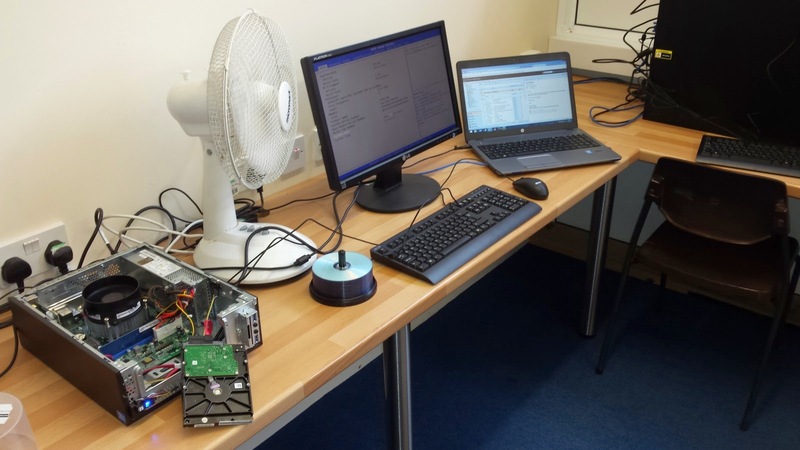 Spot the most important piece of technology on my desk.... Yep, the fan! 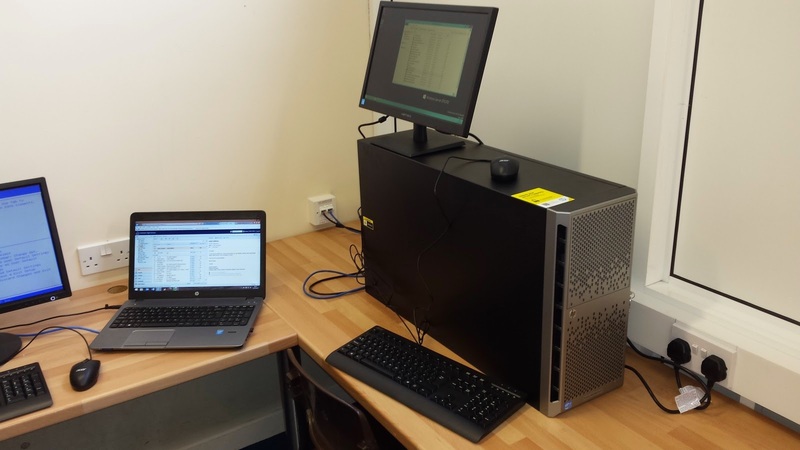 Our new Microsoft Exchange Server (currently being set up). Actually it's a host to two virtual servers (one that will host Exchange and another that will be a Domain Controller). Still working on it, but this is how my office appeared by the end of the day. Looking cosy! 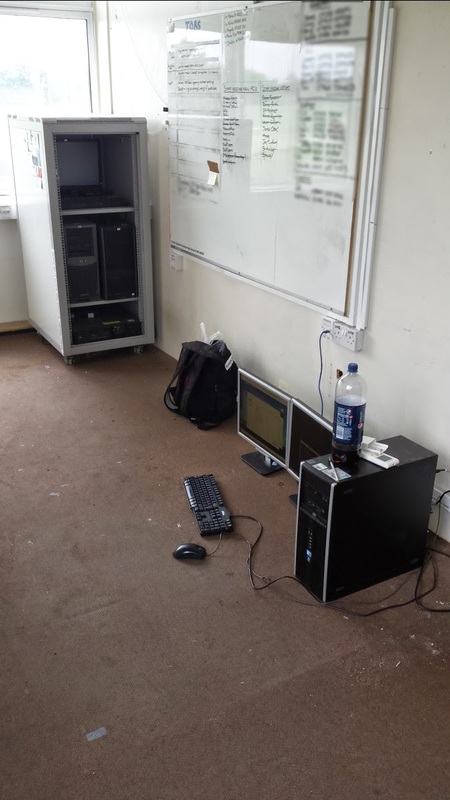 My office for the past 2 days - soon to be an IT suite with very nice, shiny new computers. Out students our sooooo lucky!! Anyway, I really do hope that the rest of the summer holiday goes as smoothly as the first few days. Wishful thinking? We'll see. I've got to say, I've been rather enjoying this summer weather over the past few days. "What? Stuart likes the summer?" I hear you say. No, not the usual sunny, hot temperatures, but the rather impressive thunderstorms that we have been experiencing lately. One thing I can not stand is when the press/news go on about the 'awful, wet weather', and that when the sun and hot temperatures come back, it's all "Glorious, lovely weather returns". Wrong - Not everyone likes the hot, sunny weather. Stop assuming that everyone likes blistering heat, and blinding sun. I hate it in fact. I suffer from severe hay fever, the heat and sun gives me terrible headaches, I sweat so much that I feel like I need to shower every ten minutes. I cant sleep at night when it's still so humid, and I feel terribly uncomfortable all day long. I hate it. I can not understand the appeal of summer. The sight of half naked men walking down the street, showing off their disgusting bodies (seriously girls, do you find that attractive?). Being stuck in a queue right behind someone who has BO - I mean seriously, instead of buying several cans of lager, treat yourself to some deodrant, or soap! Also, I can think of a thousand better places to be than on a overly crowded beach, surrounded by hot, sweaty, smelly people. And is it just me, or do others also find beaches such dirty places, with litter and rubbish left by these so called sun worshippers? AND don't get me started on men in flip flops and sandals. So, it has been rather refreshing that this year we've had some spectacular thunderstorms, and quite a bit of rain to help cool the air. OK, so the thunderstorm that we had yesterday caused a power cut at the school resulting in me having to pop in to work for an hour (on a Saturday), but hey - that's a small price to pay for such lovely weather. So, for all you people out there who think hot sunny weather is the best - spare a thought for people like me (and I know there are many others like me) who suffer during this dreadful time of year. The best weather is when it's cool and raining. Bit of wind and snow is nice too - but definitely not the sun or heat. 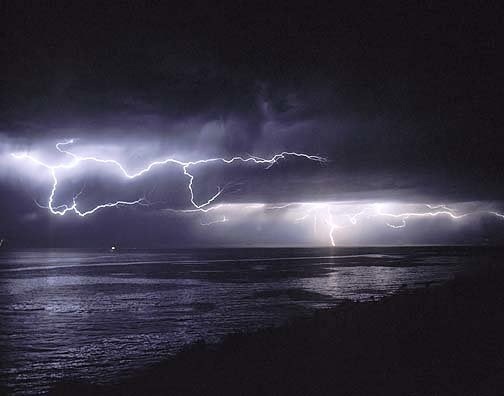 Roll on the Winter, and bring a few more thunderstorms our way please! After a sad final last day of term on Friday where I had to say goodbye to some wonderful work colleagues/friends who have decided to move on to new adventures elsewhere, the school summer holiday is finally upon me (where has the past year gone? ), which means six weeks of stress and worry while I get both Evesham High School's and Simon de Montfort Middle School's networks merged in to one. Not great when I'm having my office completely redecorated at the same time. 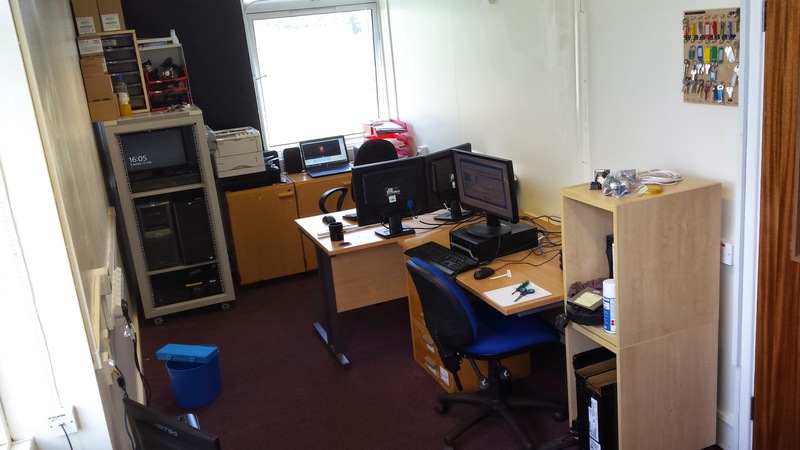 My office, as it currently looks - Who needs a desk? 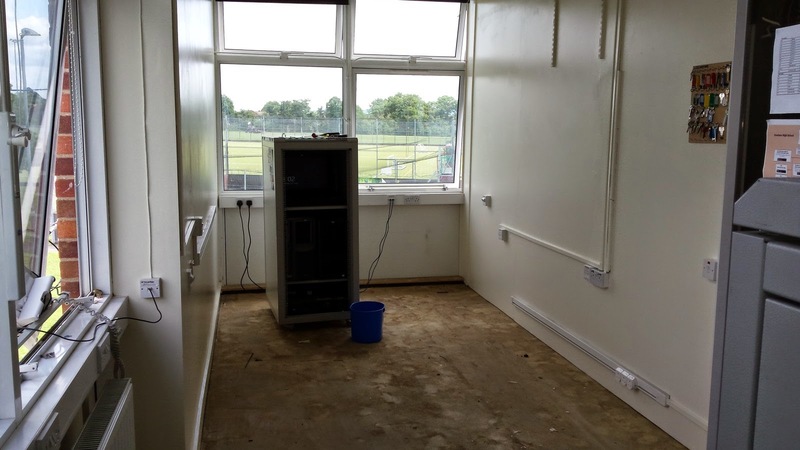 One of our ICT Classrooms (DU1), currently being used as a storage room while my office is painted, and a new carpet placed down. It's going to be difficult getting things done whilst the decorators are in, so I am really hoping that they'll be able to get it finished early this week so that I can start with the actual merge the following week. 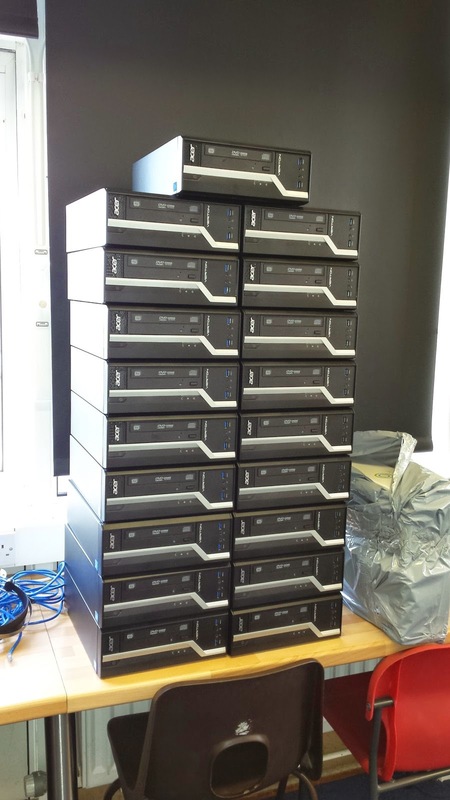 That and setting up a new suite of computers AND a new Exchange Server. This summer holiday is going to go down on record as being the most stressful ever. If I make it to September without a coronary, I'll be amazed! 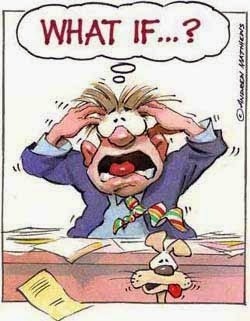 Stress, Worry, Anxiety, Oh My! Yes I know.... I am a worrier. I worry about everything, and stress about every single thing that goes on in my life. It's not healthy, and I dread to think what it's doing to my heart and blood pressure, but hey ho... What can I do. I've tried all sorts of medication (even herbal ones), but ultimately my nerves always get the better of me. With only one week left until the end of term and the start of the school summer holiday, this time of year is usually quite stress free, but I've had something on my mind now for the past few months... something big that (truth be told) has been giving me a few headaches, and sleepness nights, and now it is nearly upon me - the dreaded network merge between Evesham High School and Simon de Montfort Middle School. I think it's public knowledge now, but both schools are merging during the six week summer holiday to become an entirely new school called.... "The De Montfort School". and my job is simple - join both school networks together so that they are both on one network. Sounds simple enough, and in all fairness it is. 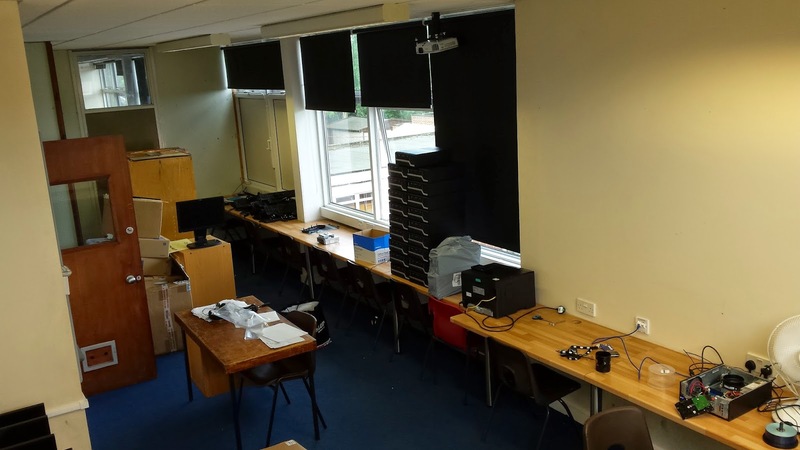 We are in a fortunate position where both schools are next door to each other and we already have a fibre cable/gigabit connection linking both sites, so the infrastructure is all ready in place. 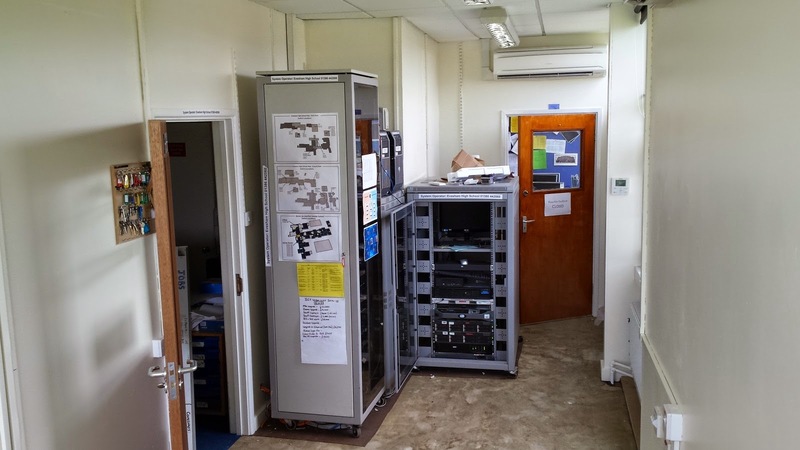 Once we configure a few network switches, we should be able to get SDM's servers and computers on to the High School's domain. The problem is, my constant worrying that something may go wrong at the start of September, or if I've missed something in my project plans. Unfortunately some of the work also needs to be completed by external contractors, so I'm worrying whether or not they can do their parts on time too. It's really messing my head up, and on many occasions I've been asking myself whether this is really what I should be doing for a living. It's not that I can't do the job - I can... It's the constant worrying. I suppose it comes with being a Manager, but I lack the ability to switch off after work too which doesn't help, and on many evenings I find myself using remote access to do some extra work on the servers from the comfort of my living room. I even admit, I don't spend nearly as much time with my family as I should. So, what is the point of this post I hear you ask? Well, I've written down my feelings before in a notebook and it helped, so I figured why not write about them here on my blog. It's not like I have many visitors to the blog, so I doubt anyone I know will read it anyway. Even if they do, there's nothing new here - everyone who knows me knows I'm a worrier. Maybe I might get a visitor who managed to control their stress and who can perhaps give me some hints/tips. Just don't tell someone who suffers from stress and anxiety to not worry. If they could, they would!